Libya: "There were sick people who needed to get out, and we got them out. Job done." "A few days ago the decision was made to organise a medical evacuation (or Medevac) of patients from Misrata, in Libya – where medical facilities have been overwhelmed due to the ongoing violence – to neighbouring Tunisia. The hospital in Misrata has been closed for several days due to heavy shelling, while the remaining functioning clinics have been overflowing with severely injured patients and are running desperately short of medical supplies. We worked out pretty quickly that the best way to do the Medevac would be by boat, so we chartered a fast passenger ferry called the San Pawl. We spent a couple of days preparing the craft, stripping it of most of its seats, laying plastic sheeting down, putting mattresses in and tying ropes up for IV lines. Our idea was that it would be a basic, floating ambulance to get the wounded out as quickly as possible. 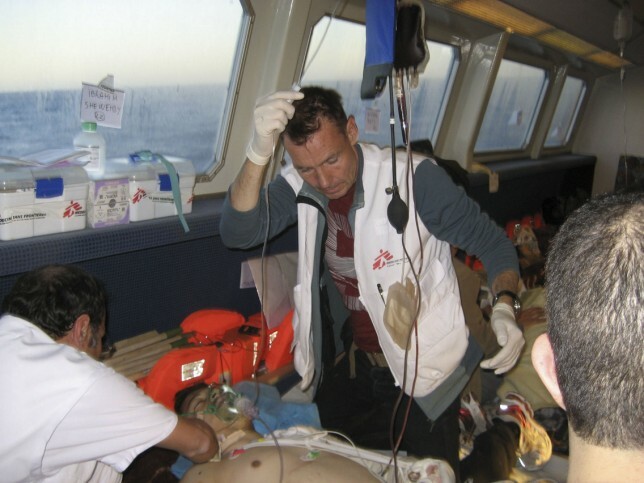 We sailed with two MSF nurses, two MSF doctors and a small team of Tunisian volunteers. It was a straightforward journey there, until we got within 20 nautical miles of Misrata, where we had to wait for around seven hours before we got the go-ahead. When that came through, we were away. Before we could load up the patients, we had to offload the cargo. We had with us about six and a half tonnes of much-needed medical supplies, including 300 surgical kits – enough to perform 1,000 surgical operations – as well as drugs, sterilisation materials and intravenous fluids. We got them unloaded and then started to carry patients in on stretchers from the dock. There were burn victims, people with open fractures and a variety of other injuries. Time was of the essence here, as we really needed to be back out in international waters before the sun went down. We got all the patients on board and were just about ready to depart when another group of patients arrived. It’s a good thing we were still there, as this group was the most critical. One guy had an amputated leg and gunshot wounds; another guy had a gunshot wound to the head. Out of the 71 we carried, 11 were seriously wounded, three with life-threatening injuries. By the time we had all the patients on board, we were rapidly running out of daylight. The captain ended up gunning it out of there at a good rate of knots, as we really didn’t want to be in those waters after dark. It was quite a rough journey, but the doctors and the nurses were fantastic. It was incredibly choppy, a lot of the patients were suffering from seasickness and, at times, it was too rough to stand. But the nurses were still there, crawling around on their hands and knees attending to everybody, while one of the doctors was down there helping patients to pee into bottles. I was just busy trying to hold on while hanging IV lines. It was 13 long hours before we docked in Sfax, in Tunisia, at 5 am on Monday, and it was a wonderful sight to see about 20 ambulances lined up waiting for the patients. Despite the rough conditions, the patients I managed to speak to who weren’t being sick were so grateful to be there and just wouldn’t stop thanking us. As far as I’m concerned, it was a successful operation and I’m glad we could help. There were sick people who needed to get out, and we got them out. Job done."